Our stoichiometric LPCVD nitride can be a very effective insulator and works great as a KOH etch mask when deposited over thermal oxide. This versatile film can be used for building MEMS devices or as a tool for defining active regions during field oxidation. As with all of our films, we have worked hard to develop a stable and consistent stoichiometric LPCVD nitride process that can be used for many applications. With our fast lead-time you can feel confident using our stoichiometric LPCVD nitride throughout your device fabrication process. 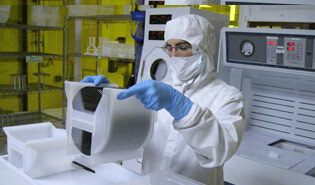 We encourage you to take advantage of our process reservation options, and pre-schedule your nitride runs before your wafers arrives at our facility.